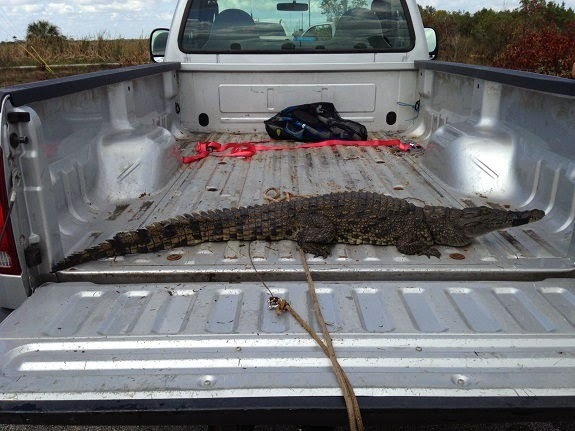 GAINESVILLE, Florida — DNA analysis has determined that invasive Nile crocodiles captured in Florida between 2010 and 2014 are related, according to a new study by University of Florida researchers. Nile crocodiles are the second largest crocodillians in the world that can grow to 18 feet long and weigh as much as a small car. Unlike alligators that typically swim away from human encounters, Nile crocodiles view humans as a food source, having developed a taste for the primates over millions of years in their native Africa. Three juveniles of the monster crocodile have been found in South Florida swimming in the Everglades and relaxing on a house porch in Miami. Scientists verified the animals were Nile crocodiles linked to native populations in South Africa, and confirmed the species can survive in Florida—and potentially thrive, said Kenneth Krysko, herpetology collections manager at the Florida Museum of Natural History on the UF campus. In other words, there likely are more. DNA revealed the three similar-size Nile crocodiles were genetically identical, suggesting they were introduced via the same source, but Krysko said the source has not been confirmed. Prior to graduating in 2013, former UF doctoral student and co-author Matthew Shirley extensively sampled DNA of live Nile crocodiles housed in U.S. zoos, including Florida. The DNA of the three crocodiles did not match any of those Shirley sampled, suggesting they were either acquired by a permitted source later, or introduced by someone without a permit. Florida’s subtropical climate is one reason the state has the world’s largest number of invasive species—from the green anaconda to the cat-eating monitor lizard, which have been found as far north as Central Florida. The State of Florida spends over $80 million a year to help rid the Sunshine State of invasive species.